Australia Needs You.com Pty Ltd is a private business and not affiliated with the Australian or New Zealand Government or their Immigration Departments. We supply professional advice to help migrants and visitors applying for a suitable Australian or New Zealand visa. The Australian Government, that is the Department of Immigration and Border Protection (DIBP) and the New Zealand Immigration are the only entities that will decide who is granted a Visa. Natasa Shelley is the a Managing Director of Australia Needs You.com Pty Ltd. She is a registered migration agent in Australia holder of Migration Agent Registration Number 0848175 and an Immigration Adviser in New Zealand licence number 201200229. Australia needs You.com Pty Ltd operates online through www.australianeedsyou.com. By signing Agreement and/or making a payment to Australia Needs You.com Pty Ltd you are confirming that you have read and understood the Terms and Conditions for our supply of services to you, you have read the document Information on the Regulation of Migration Advice Profession and a Code of Conduct (Australia) and Code of Conduct New Zealand as apropriate under which registered migration agents and Immigrating advisers operate. Australia Needs You.com Pty Ltd provides Australian and New Zealand visa and immigration advice subject to the following terms and conditions. “Registered Migration Agent” ‘Immigration Advisor” or “We” or “Us” or “Our” or “I”– means the Australia Needs You.com Pty Ltd and Registered Migration Agent or Immigration Adviser who is appointed to your matter. “Business Day” – means between 9am to 5pm on any day that the DIBP office is open for business in Brisbane, Australia. “Client” or “you” or “your” or “user” – means the person who has engaged the services of Australia needs you.com or the person who has made a payment to Australia Needs You.com Pty Ltd for its services. Advice provided to you is based on the legal and policy requirements, which are applicable and publicly available at the time you engage our service. We will not be responsible if changes of legislation or policy occur and are not publicly available at the time we provide you with the service or after our services were provided to you. Upon payment you will be allocated a Registered Migration Agent/Immigration Adviser and his/hers email address. All communication between you and your Registered Migration Agent/Immigration Adviser must be sent through this agreed email address. We reserve the right to at any time appoint you a new Registered Migration Agent/Immigration Adviser to your case. We provide the following main services: Online Consultations, Assistance to self-representing applicants and Professional assistance to other Migration and Education Agents. All these services are detailed in Services section of the website and n your Agreement. Are not appropriate in your circumstances. Our Professional fee is paid in advance or as agreed between the client and our Registered Migration Agent/Immigration Adviser. GST applies for the clients that are in Australia at the time of engaging our services. In addition to our professional fee you are also required to reimburse any cost properly incurred by us that is relevant to your case and any costs associated with the immigration assistance. Other costs that may be incurred on your behalf are Visa application charges, cost of translation and certification of documents, English language test, cost of health assessment, cost of police clearance certificates, cost of skill assessments, Government application charges and other costs. Sometimes, we may ask you to pay the fees directly to the relevant body providing the service and we cannot be responsible in any way for these auxiliary costs. We may also require you paying the Visa application charge to our nominated account before lodgement of your application to the DIBP or Immigration New Zealand. If for a particular reason it becomes necessary for us to make a payment on your behalf, we require you to reimburse us within fourteen days (14) from the date of our invoice. We require you to pay all our costs including service charges that occurred on your behalf by the date of lodgement of the visa application. Service charges include photocopying, printing, facsimile, telephone charges, postage and courier fees. Telephone charges and courier fees apply only if separate quoted. Most payments made in Australia are subject to a Goods and Services Tax (GST) amounting to 10% of the invoiced amount. Our Professional fee will be quoted and billed with GST only if it is applicable. The GST applies only if you are in Australia when using our services to apply for an Australian visa. DIBP and Immigration New Zealand application fees are GST exclusive. Our business is internet based. We provide for you the relevant information about visas categories and assessing your eligibility through emails. If you experience any difficulties after attempting to complete all our required forms you may seek our assistance through our provided contacts including a telephone or skype number. Any general questions regarding immigration to Australia should be submitted through our paid service. The Australian and New Zealand Government’s immigration policies are fluid and may vary according to government or public demands. While every effort is made to update the information contained on this website, neither the Website owner or its Director, officers and employees, nor any third party or data or content provider make any representations or warranties, whether express, implied in law or residual, as to the sequence, accuracy, completeness or reliability of information, opinions, research information, data and/or content contained on the website (including but not limited to any information which may be provided by any third party or data or content providers and shall not be bound in any manner by any information contained on the website). The Website owner cannot guarantee the website is free of technical difficulties, viruses or any other harmful material and we reserve the right at any time to change or discontinue without notice, any aspect or feature of this website. We cannot guarantee that the services provided by us will be uninterrupted, continuous or error free. No website information shall be construed as advice. Information is offered for information purposes only and is not intended for personal or business purposes. The information contained on this website and your use of the site is at your sole risk. If you find an error or omission at this site, please contact us. The information included in this website has been compiled from a variety of sources and is subject to change without notice. As application forms, fees and criteria are subject to change without notice, you may also wish to refer to the official Department of Immigration and Border Protection website (www.border.gov.au) or Immigration New Zealand (www.immigration.govt.nz) should you seek verification of any information contained within this website. The content included in the website including applications, software, underlying source code and all other aspects including text, graphics, trademarks, names, logos and service marks (collectively “trademarks”) displayed on this website are registered and unregistered trademarks of www.australianeedsyou.com and Australia Needs You.Com Pty Ltd its affiliates or content and technology providers. Nothing contained on this website should be construed as granting any licence or right to use any material or trademark without the prior written permission of the Website owner. The website user is forbidden to violate any copyright, trade mark, other applicable Australian or international laws or intellectual property rights of the Website owner or any other third party. In accessing these web pages, you agree that any downloading of content is for personal, non-commercial reference only. No part of this web site may be reproduced or transmitted in any form or by any means, electronic, mechanical, photocopying, recording or otherwise, without prior permission of the Website Owner. External links are provided for your convenience, but they are beyond the control of the Website Owner and no representation is made as to their content. Use or reliance on any external links and the content thereon provided is at your own risk. When visiting external links, you must refer to that external websites terms and conditions of use. No hypertext links shall be created from any website controlled by you or otherwise to this website without the express prior written permission of the Website Owner. Please contact us if you would like to link to this website or would like to request a link to your website.  All migration agents operating in Australia must be registered with the Office of Migration Agents Registration Authority (OMARA). We abide by and provide services in accordance with Office of MARA and Code of Conduct for Registered Migration Agents. All licensed immigration advisers for New Zealand must be registered from May 2010 with the Immigration Advisers Authority. We abide by and provide services in accordance with Immigration Advisers Authority’s Code of Conduct. Links to these documents are provided for you on our website. If for whatever reason you are unable to access these documents, you may contact us prior to making any payment. By making a payment to Australia Needs You.com Pty Ltd you acknowledge that you had the opportunity to review the above documents. At Australia Needs You.com we will as reasonable keep the client informed of the progress of the matter. Pay our professional fees and other relevant disbursements as per our invoice in fourteen days (14) from date of the invoice. Use our website within the conditions of these Terms and Conditions. The client is responsible for the accuracy and completeness of the information supplied to us. We will use this client-supplied information when assessing your eligibility for an Australian or New Zealand Visa and when making the visa application on your behalf. It is critical that your information supplied is correct and complete. Where we specify timeframes, we will use our best endeavour to meet these times. When we receive your payment it is deemed that you have agreed to use the services of Australia Needs You.com Pty Ltd. We will happily refund any uncommitted monies if a refund request is received within 24 hours of your payment being processed. Any fees paid to us regardless of visa outcome will not be refundable except if agreed, beforehand. Our consulting services and assistance in your own visa application advice provided by us, does not include any requirement for us to act on your behalf in relation to your Australian or New Zealand Visa application at DIBP or Immigration New Zealand or any other authority. Using these services, we only provide you with advice and assistance how to prepare documentation and not with any representation at the relevant bodies. We will not be responsible for any adverse outcome of your visa or any other application as we are not acting as your representatives and deal on your behalf with authorities. We represent you and act on your behalf only, if we agree on a full representation by signing an official Agreement regarding the representation and sign appropriate forms. We shall not be responsible for and disclaim liability for any loss, claim, damage, cost or expense (liability) whether direct, indirect or consequential (and whether in tort (including negligence) contract, equity or otherwise), personal injury or expense of any nature whatsoever which may be suffered by you or any third party (including you or your company), as a result of or which may be attributable, directly or indirectly, to your access and use of the website, any information contained on the website, your or your company’s personal information or material and information transmitted over our system. In particular, neither the Website owner nor any third party or data or content provider shall be liable in any way to you or to any other person, firm or corporation whatsoever for any loss, liability, damage (whether direct or consequential), personal injury or expense of any nature whatsoever arising from any delays, inaccuracies, errors in, or omission of any information or the transmission thereof, or for any actions taken in reliance thereon or occasioned thereby or by reason of non-performance or interruption, or termination thereof. The Website owner makes no warranties, representations, statements or guarantees (whether express, implied in law or residual) regarding the website, the information contained on the website, your or your company’s personal information or material and information transmitted over our system. The information contained on this website and your use of the website is at your sole risk. To the extent that liability cannot be excluded and without limiting the effect of any other provision of the agreement, the parties agree that by the client making a payment for services the client is agreeing that the total liability of Australia Needs You.Com Pty Ltd, its director, employees, associated companies and consultants and whether under this agreement or otherwise, is limited to the cost of supplying the service that Australia Needs You.Com Pty Ltd provides the client or refunding the amount paid under this agreement. We can only provide advice on visa matters and cannot provide advice on any other matters including employment, housing, wages, investments, business, taxation and other matters. Any such information should be used as general non- specific information and you should employ professionals to supply you with accurate advice on these matters. You may terminate our services and withdraw your instructions at any time in writing. We reserve the right to terminate our services if we discover incorrect or misleading information has been supplied by you, or you fail to give us adequate instructions, or you fail to pay any accounts for fees when required to do so, or you have used this website inappropriately or you have failed to comply with the Terms and Conditions. By visiting or using our website you agree that any relevant Terms and Conditions, policies and notices shall be governed by and construed in accordance with the laws of the State of Queensland, Australia without giving effect to any principles of conflict of law. By purchasing a service from us you hereby consent to confidential arbitration under the exclusive jurisdiction of the Courts of Queensland in respect of any dispute of any sort that might arise between you and us or our affiliates, or any relevant Terms and Conditions, policies and notices or any matter related to or in connection therewith. At Australia Needs You.com we shall be entitled to cede, assign and delegate all or any of our rights and obligations in terms of any relevant terms and conditions, policies, notices and migration applications to our agents or immigration advisers.